Gosh, did we fall in love with Dijon. For one, it wasn’t jam-packed with tourists, and two, the food was amazing whether in restaurants or at a casual bistro. Le Pré aux Clercs has an inexpensive lunch menu that costs 32 euros and trust me, I was stuffed to the brim. It’s a three-course affair but as we found out, there are two parts to amuse bouche, bread, and petit-fours. For dinner the menu starts at 55 euros but it’s a whole lot more interesting too. More techniques seen, and more unusual ingredients. So I went for the 32 euro menu, and the parents went with the 55 euro menu. Unlike William Frachot’s more modern setting, Le Pré aux Clercs exudes the classy,elegant, upscale vibe that I know some people would be uncomfortable with. That said, the staff are extremely well trained and not snotty at all. They didn’t turn us away at the door though we weren’t exactly in proper attire (tired travelers who just got off the train…) and were extremely helpful with putting away our rain gear and getting us comfortable. While we were deciding on our menu, the first amuse bouche was served. I realise that both the michelin-starred restuarants we visited took this first complimentary course seriously in that it did accurately reflect the direction they have towards their food. This amuse bouche (compared to William Frachot’s) was less complicated for sure, but no less decadent and rich. Their eggplant mousse was a huge win for me (the one in the spoon). It may look unappetizing but the mousse was light and airy, creamy without drowning out the flavour of the eggplant. Great texture and flavour. Do give their juices here a shot. Mum had juice on both occasions but we liked this apricot juice more for its strong, bright flavour and thick consistency. Oh and of course, every restaurant in Dijon (not just the michelin-starred ones) takes pride in their list of wines which feature an extensive selection of Burgundian wines. I can’t appreciate it but dad sure did! Our second amuse bouche was a simple mushroom soup. My first course was a simple salmon tartare with vegetables. Fresh and light. The raw herbs were unexpectedly delicious. It looked like cilantro to me but it didn’t have that nasty smell to it. As plain as it looks, dad’s pike quenelle in mustard cream was actually very delicious. We weren’t foreign to this having tried it at a Lyonnaise Bouchon last year. This version was much lighter than the one we had, and the mustard cut through the heaviness of the sauce. For the uninitiated, a quenelle is the french equivalent of our fish cake. Mum’s pie was equally delicious (can’t remember if it was duck…). As with all pies, it retained its heat all the way through our meal. Always a plus point for us Singaporeans since we like things “piping hot”. In any case, with that thin buttery crust and moist filling, it was demolished in no time. Dad’s red mullet with stewed mushrooms, rhubarb and hazelnut butter was also a hit with all of us. Simple, easy-to-like flavours. The only dish that we didn’t really like and didn’t finish (also partly because the portion was huge.. two fillets!) was mum’s fish. Can’t remember what it was… the sauce was just weird… It was just the flavour we weren’t used to I guess. 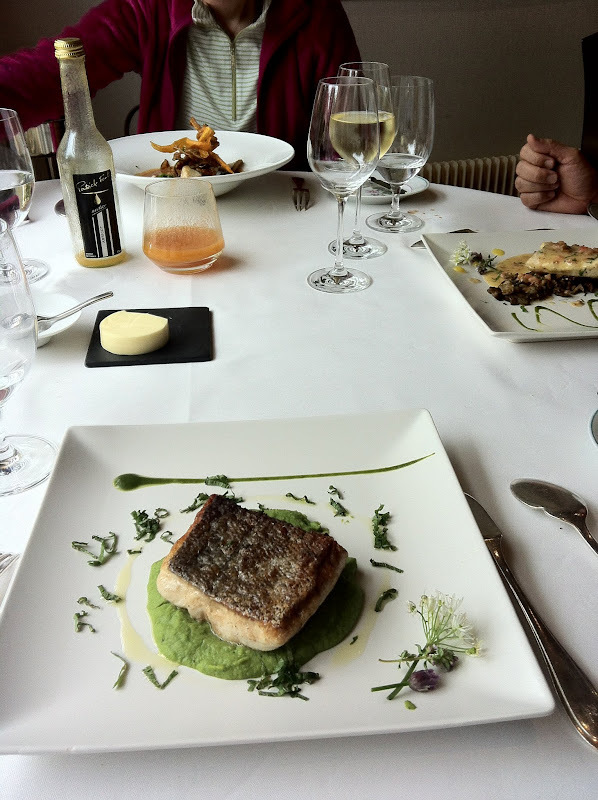 If I’m not wrong I got a sea bass but anyway what I really loved was the creamed mint-pea mash below. Mint gave the mash a refreshing touch that lightened up the heaviness. The parents got a cheese that was way way too strong for us, people who don’t eat much cheese in the first place. It’s called the Époisses de Bourgogne, from the village Époisses which according to the staff was not far from Dijon. The smell is so pungent but I can imagine people liking it. I can imagine myself liking it if I had it with bread… or with biscuits and jam but definitely not alone with leaves…. Mum’s lemon meringue with lemon sorbet and strawberry granita. Dad’s pistachio streusel with white chocolate ganache. Beautifully constructed, good flavours and textures but none too exciting, as with the former. My dessert of the day was the classic pear poached in red wine. This was perfectly done but again, flavours were predictable. Our petit fours- buttery sables, almond tuiles, macarons and canelés. The macarons were quite horrible. Sticky shells…. and I hate macaron shells that aren’t glossy! Favourites were definitely the canelés – lovely caramelisation- and the sables. I guess Le Pré aux Clercs focuses more on doing the classics well. Techniques were well executed, but nothing we haven’t seen before unlike William Frachot (hence the flavours and textures were more predictable than at William Frachot). Nothing wrong of course! It’s a matter of preference. For me, the latter meal was just a bit more exciting. Still, Le Pré aux Clercs (with its white linen, impeccable service and menu) is probably one of the best examples of French fine dining. I guess the fact that the restaurant faces the Palace of the Dukes of Burgundy made it feel even more posh than it already was!